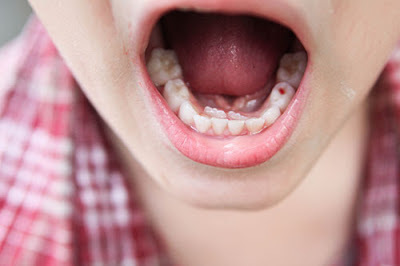 The CoffeeShop Blog: My Son Has Shark Teeth! My Son Has Shark Teeth! If you meet my 6 year old he will proudly tell you he has shark teeth. What are shark teeth you might ask? I didn't know either until last week. My husband brushes Imp's teeth before Imp goes to bed every night, so I hadn't really looked in the boy's mouth for a month or so. Last week I decided to actually floss Imp's teeth for a change and recoiled in horror when I found a second set of teeth behind his bottom teeth. I ran to tell my husband and the first words out of his mouth were "Cool! He has shark teeth!". My first words to him were "How in the h**l did you not notice this!". Note to self: Use kind words, especially when you are confronting your husband who generously brushes your 6 year old's teeth every night. In a side note: Today we are celebrating our 26th year anniversary of the day we met. My husband is a saint. I have a thing about teeth and freak out if something is not "normal" in my boys' mouth, so I frantically googled AND called their dentist. My dentist thought it was hilarious that I was so worried and assured me he sees kids weekly with this type of issue and told me if the baby teeth were loose (they are) wiggling them until they fall out usually resolves the problem. Then the adult teeth generally move to their proper position. If they don't come out on their own in a few months, worst case scenario, they will have to be extracted. Imp has already had one of his top teeth pulled after a really bad fall where he completely peeled all of the skin above that tooth. It looked like a skeleton tooth and finally had to be pulled due to multiple infections. 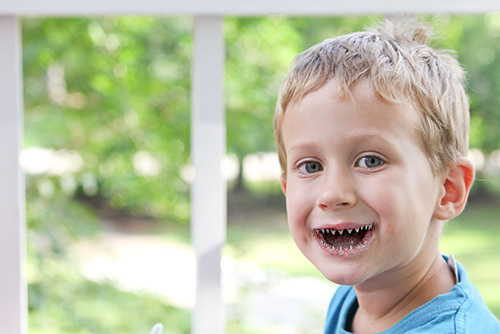 Here are his shark teeth (he just ate strawberries as you can tell by the pink tooth). If you ever see him around town be sure to ask to see them. He loves to show them off. I bet he loves the photo too! This happened to me with my son and I flipped out too. My dentist did remove his baby teeth as they were not loose AT ALL. This started the process of getting teeth pulled on a regular basis. All but one of his baby teeth had to be pulled. But his teeth are perfect now (he is 32). Love that photo! My neice,Kandace had the same thing happen. She is almost 8 now and her bottom permanent teeth are just as pretty and straight as can be. I'm sure Imp will enjoy being sharkboy! Just love your shark teeth, great for chewing too. What a clever Mom you have to have photos to remind you of your shark teeth when you grow up. By the way, lots of sharks living in the waters where I live in Australia. This happened with my son last summer too! Both of the bottom teeth, and we ended up having the baby teeth pulled because they were not at all wiggly. There are pictures on my blog if you are interested! My son's do the same thing but I had not thought about the shark teeth angle lol. He will love that! Love all of you work and use them on a regular basis! Thank you. You have taught me so much!